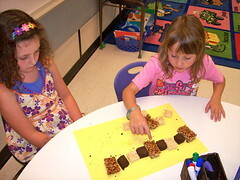 “Puffed wheat, brownie, rice krispie, brownie, puffed wheat, brownie, rice krispie, brownie” chanted one of my students as she explained the pattern she had just made with pieces of cake. We were in the middle of a passion-based learning (PBL) unit themed around patterning. “I wonder if you can make patterns with cake” one of my students had asked? And so we tried it. I have wondered for a long time how passion and project based learning would change my primary classroom. I have read with fascination the blogs of teachers who made this shift, but I have yet to find an example of a primary teacher sharing this change. Having an entire class of pre-readers and writers in your classroom alters the playing field for exploring your passions. This year, I decided to find out for myself what the difference would be in my grade one learning space. I decided to do a patterning unit first, and kicked it off by showing the students an Animoto I had made with copyright-free photos of patterns in the environment. Frankly, I would do this differently next time. My six-year olds seemed to be intrigued, but were not sure of what their response should be, and it did not elicit the questions I was hoping for. I talked to the students about the expectations of our curriculum. Then, I asked them what they would like to learn about patterns. As they formulated their questions, I gave them a card with I wonder… printed on it, and they went to a table to draw a picture of their question. As each picture was finished, I printed the words to end their question for them, and the children trotted off to our Wonder Wall to post them. The next day, I showed the students where to find information and materials in our classroom and then told them to choose one of their questions from the wall and to use anything we had to find the answer. The students worked individually or in a small group with paper and crayons or manipulatives and made patterns, patterns and more patterns. As the students discovered the answers to their questions and dictated them to me, I printed their solutions on a strip of paper for them to copy onto a new card that already had I learned… printed on it. Then, these cards went onto the What We Learned wall in the classroom. This process continued throughout our unit. Some questions the students wondered about couldn’t be answered by their working on their own. “I wonder if there are patterns in my basement?” needed some parent support. “I wonder if snakes have patterns?” meant I needed to share an informational picture book with the class. The question above about patterning with cake meant that I had to do some baking. Some questions, such as patterning with paper boxes, stimulated everyone’s interest. Questions about patterns on grass and ladybugs led to a host of new questions that meant we had to move outside to do some discovery. (And meant that we were also venturing into our science and math studies.) There were some days that had to be more teacher directed. During the unit, we made Skype calls to some global friends, and we made sure to ask about patterns in the other classrooms. As we worked through our questions, we kept coming back to our overarching inquiry, what is a pattern? At first, we just made suggestions and recorded the answers. Later we came back to these suggestions to see if what we had previously documented still reflected our thinking about patterns — adding or removing statements as necessary. Sometimes we used these scribed responses to determine whether something was a pattern or not. At the end of the unit, each of the children produced a digital artifact to show what they had learned. These were all posted on their blogs. As this was the first time we had done this, I reminded them of what our objectives were at the beginning, and gave some ideas of ways they might choose to express what they knew, although I was open to their ideas as well. Some students chose to animate their patterns with Animationish or make a digital picture and record their voices with Audioboo. Others chose to use the iPad app ScreenChomp and made a screencast. A few made posters and explained them while another student recorded it on video. Is this what passion-based learning looks like in a primary classroom? I think I’m getting there. I loved the fact that we could learn curriculum outcomes based on what the students (not the teacher’s guide or myself) chose. Digital artifacts have been a part of my classroom for a long time, but I prized the specificity of the ones we created this time. I have some still-forming ideas for ways I want the next unit to be better. However it turns out, I think I’m hooked. And I’m definitely still learning. In the meantime, the excitement and learning that took place when we tried to look at ladybugs (they were incredibly fast and hard to keep track of) showed me exactly where we should go with our next unit. Living things, here we come! Kathy – There are so many great things to take from your post! Thanks for sharing. Your students will recognize patterns everywhere now! I love how you are taking their questions, and letting them guide the instruction to make it meaningful for them. That flexibility and spontaneity makes your classroom a fun place to be! The “wonder wall” is fantastic. I’m already thinking of ways I can use it in my 4th grade classroom. We’re working on Internet research with our new netbooks, and the “I Wondered –> I Learned” idea would be a great way for my kids to follow their passions, construct their own learning, and share with the class. Keep up the great work, and please keep sharing!! Thanks, Patti. I don’t think I can take credit for the Wonder Wall idea. I heard it somewhere last summer in my “research” phase. 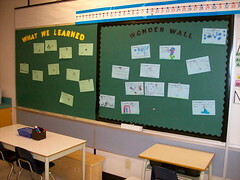 What I really think I could transfer to my middle school environment is the way you designed and use the Wonder Board. Just even the name….Wonder Board….well, it invokes my curiosity. I’m wondering this Sometimes students think they know something but they’re not sure if it’s correct. They don’t know where to put their “Know” because they don’t know if they’re right or not. My colleague introduced me to the idea that a KWL could be modified to Wonder, Think I Know and Know….that way you think you know something you can put it under Think I know an if you’re wrong, it’s OK.
Maybe that’s not helpful for your age children, but I think it could be how I could modify this for middle school aged kids. What do you think? Have you picked out your next PBL topic? I really like the idea of the “I think I know”, Marsha. I can think of several ideas the students had which would fit into that. I’m thinking. Kathy, thank you SO much for posting this. When you wrote, “I have read with fascination the blogs of teachers who made this shift, but I have yet to find an example of a primary teacher sharing this change,” I was nodding my head furiously. I have read just a few examples of what PBL looks like in an intermediate class so I love reading your implementation of PBL for primary kids. One thing that we did that was similar was your Wonder Wall. I’m already out of walls in my room so I create a chart on my white board and had the kids add post-its. Of course they all fell down, but I was able to create a document with the kids’ questions about the Iditarod. This document became the kids guide as they researched and practiced using the different reading skills we discussed. I love that you had the kids create digital artifacts. My groups all chose to make posters, but we did video tape them and add them to our blog. Perhaps as we finish our learning about the Titanic, I will require digital artifacts. Besides the opening Animoto, is there anything else that you might change for your next PBL activity? It sounds to me like YOU should be blogging about PBL, Becky. If you videotaped their posters and added that to your blog, I would say you created a digital artifact. As for things I would change, I can’t think of anything else that was in the article, but I am always learning. I think some of our research methods will change as the students mature and begin to read as well. Thanks for describing your and students’ learning as you journey through PBL together. I agree that there are not enough examples being shared of how PBL comes to life in the elementary grades. Thank you for demonstrating that not only is this shift possible, student engagement in this manner will help fortify students’ foundational academic skills. Will be sharing this with my teachers! As I sit here in my classroom surrounded by piles that still need to be sorted before the start of school on Wednesday, I was delighted to read your article about PBL for the young ones. Glad to see you are exploring how to bring PBL into their curriculum because I have always felt they are the ‘natural’ ones for this approach. They are so full of questions, love to experiment and explore, eager to share their ideas. Perhaps most importantly, they are willing to wonder. Sometimes that gets lost as students progress through school. Would love to share ideas with you as we both explore bringing passion-based learning to K-2nd graders.